At 2:00 a.m. on Oct. 19, 2001, 39 days after al Qaeda terrorists attacked American soil, a special operations MH-47E Chinook helicopter touched down in a remote section of the Darya Suf Valley in northern Afghanistan. The instant the ramp at its rear dropped, 14 heavily laden men, 12 from Operational Detachment-Alpha (ODA) 595 and two Air Force combat controllers, grabbed their gear and extra supplies and rushed out. As soon as the last man had exited and after a quick visual check to make sure nothing had been left behind, the helicopter lifted off and departed. Total elapsed time of the insertion: less than a minute. ODA 595 and its commander, Capt. Mitch Nelson, scanned the dark landscape around the landing zone. Gradually shapes emerged out of the shadows – a small group of Afghan Northern Alliance soldiers together with four American advisers who had been in country for about two weeks. Greetings were brief, and within minutes the Special Forces operatives and combat controllers shouldered their 100-pound rucksacks and extra bags of gear and supplies, that included everything from computers and sophisticated communications gear to sacks of horse feed, and followed their guides down a mountain trail to their base camp. It was hoped they would meet later in the day with the Afghan warlord, Gen. Abdul Rashid Dostum. At about the same time, another team, ODA 555, landed hundreds of miles south in the Panjshir Valley, was linking up with another Northern Alliance force. Task Force Dagger was on the ground. Operation Enduring Freedom-Afghanistan (OEF-A) had just shifted into high gear. OEF-A was the military response to the 9/11 attacks. Its goal was to overthrow the Taliban government of Afghanistan that was providing a safe haven for al Qaeda and its leader, Osama bin Laden, and in the process hopefully eliminate al Qaeda itself. The air campaign against the Taliban, which included bombing military targets and airdrops of humanitarian supplies for the civilian population, began 19 days later, on Oct. 7. The humanitarian part of the air campaign eventually totaled more than two million rations for the starving populace. The military part, centered on Predator drones, unarmed and armed, with their small profile and high-resolution cameras, proved disappointing. The drones had fired 115 missiles at targets and laser-designated an additional 525 for other aircraft. But the combination of fighting a non-industrialized nation possessing a primitive infrastructure and strict rules of engagement designed to minimize American aircrew and Afghan civilian casualties hampered effectiveness. Simply put, in too many cases the cameras of the Predators couldn’t identify friend (or neutral) from foe to high command’s satisfaction, nor could they see through the camouflage created by the Taliban, who masterfully exploited the rugged terrain to hide their military assets. To ramp up air strike effectiveness, trained men had to be deployed. The need to get Special Forces ground teams into Afghanistan was urgent. But even with the Special Forces teams deployed, much skepticism remained regarding their actual value. At this point, the outnumbered, outgunned, and undersupplied Northern Alliance had its back to the wall, controlling only about 15 percent of the country. And, no matter how effective the bombing campaign might become, everyone acknowledged the truism that campaigns of liberation or conquest are won not in the air, but on the ground. At best, senior commanders hoped the Green Berets would be able to boost Northern Alliance troop morale and help hold off the better-armed Taliban forces until larger American forces arrived. The senior commanders weren’t the only ones with doubts. When Nelson and his men met Dostum and saw some of the troops under the warlord’s command, they found themselves looking at a lightly armed and ill-equipped motley force that included hundreds of horse cavalry. Given that the Taliban with its modern, mechanized forces outmatched the Northern Alliance in every possible way, they could be excused for wondering how things would turn out, and if they’d even survive. Bold, bluff, expansive, opportunistic, charismatic, and – in complete contradiction to an intelligence report that described him as sickly and diabetic – hale and hearty, Dostum, an ethnic Uzbek warlord with a seventh-grade education, possessed all the traits and skills necessary to survive and hold power in the fractured and cut-throat political environment that dominated Afghanistan. During the Soviet invasion of the 1980s, he served with the Soviet-backed Afghan army fighting the mujahideen. When the communists started losing, he switched sides. In the subsequent civil war, he was one of a number of powerful warlords with a strong militia jockeying for control in a shattered country. For a time he controlled Kabul, but with the rise of the Taliban in the mid-1990s, Dostum found himself outmatched. Eventually the Taliban army cornered him and his militia in a remote section of northern Afghanistan. As things went in this part of the world, he was as reliable an ally as one could expect – perhaps even more so because the Taliban had put a price on his head and Dostum knew there was no chance of rapprochement with them. The meeting between Nelson and Dostum was little more than a quick meet-and-greet affair. The next thing Nelson knew, he and half his team were uncomfortably perched on wooden saddles too small for their large frames and awkwardly riding undersized Afghan ponies up to Dostum’s mountain headquarters. All but Nelson, who, thanks to his upbringing on a ranch and rodeo-riding competitions in Kansas was an expert rider, would learn on the steep mountain trail horsemanship skills that had not been taught in the U.S. Army for more than 50 years. About eight hours later, with all of the Americans stiff and saddle sore, they arrived. Minutes later, Dostum and Nelson were standing at a nearby observation post. Dostum pointed to an outcropping on a ridge miles away on the other side of the valley – a Taliban bunker. Even with high-powered binoculars, it took Nelson a while to confirm it. Then the general asked, “Can you bomb it?” Nelson said he could, but that he wanted to get closer in order to ensure accuracy. But this Dostum refused to allow – he was afraid that if any American under his protection was wounded or killed, all the Americans would leave. The air strike would have to be called from this location. Nelson pulled out his GPS, aimed it at the distant bunker, and took a reading. After plotting the position on a map, he got on the satellite phone and relayed the coordinates to a B-52 flying a racetrack pattern in a holding position high above, awaiting instructions. Thirty seconds after the message was confirmed, a 1,000-pound JDAM – joint direct attack munition – hit the ground and exploded … about a mile away from the target. A second bomb landed, closer, but still well short. Then came a third, landing about 600 feet from the bunker. With each explosion, Dostum’s men cheered and high-fived each other. Two more bombs were dropped, landing about two miles away. Nelson, embarrassed by the inaccuracy of the air strike, kept his feelings to himself as he radioed the pilot to end the strike. Though Nelson was disappointed, Dostum was thrilled. The Americans had demonstrated their power, boosted the morale of his men, and, he said, put fear into the hearts of the Taliban in the bunker. Now Dostum could begin to think of the tantalizing prize lying to the north, the city of Mazar-e Sharif. Mazar-e Sharif is strategically located in the Darya Suf Valley and less than 40 miles south of the border with Uzbekistan. Whoever possessed it historically controlled the gateway to the capital city of Kabul, about 180 miles to the south. Now with Americans at his side, Dostum could launch the campaign to capture Mazar-e Sharif. It would start on Oct. 21 at the fortified village of Bishqab. The combined Northern Alliance troops and Green Berets arrived at their staging area in the late morning. As the Afghan troops began assembling, Nelson, from his observation point two miles from the enemy’s position, began his reconnaissance. Through his binoculars, Nelson could see a cluster of empty mud houses on top of a hill that was the village of Bishqab. On another hill nearby he identified at least one trench and a collection of brown pickups, several T-54/55 tanks, a number of BMPs – armored personnel carriers armed with cannons and machine guns – and several ZSU-23 anti-aircraft artillery. 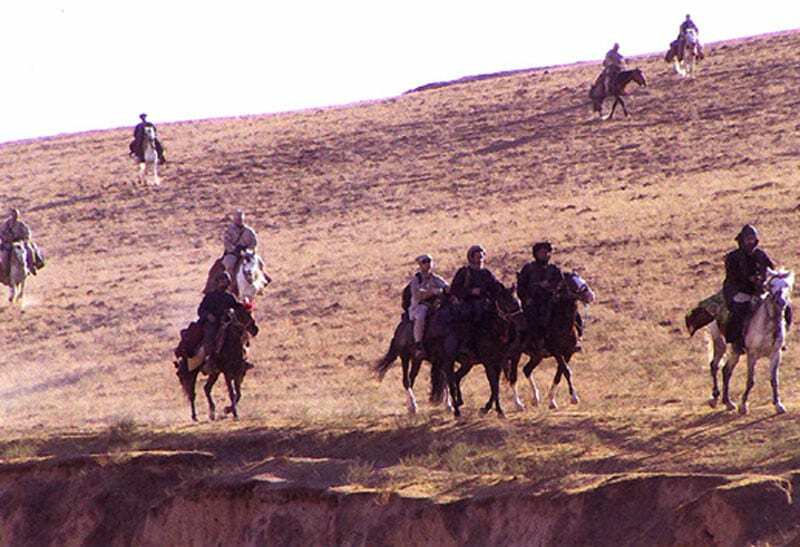 To reach the enemy, Dostum’s troops, about 1,500 cavalry and 1,500 infantry, would have to travel a mile over an open plain cut by seven ridges, each between 50 and 100 feet high and spaced about 600 feet apart. The momentum of their attack would be slowed during the crossing of those ridges and, worse, make them sitting ducks each time they reached the top of a ridge. To anyone familiar with military history, the Battle of Bishqab had the potential of being the Charge of the Light Brigade, Fredericksburg, and Pickett’s Charge at Gettysburg all rolled into one. The difference here, of course, was American air power. But would it be enough? With his position plotting complete, Nelson began calling in air strikes. As the bombs began to fall, Dostum shouted into his radio, “Charge!” The first horse cavalry charge of the 21st century had begun. When the first wave of horsemen had covered about a half-mile, the surviving Taliban heavy weapons opened up. Men and horses began falling to the ground, dead or screaming in pain from their wounds. But whether it was the fact that the horsemen were moving too fast, that the Taliban troops had not ranged their weapons, or some other reason, the defensive fire was not as concentrated or as accurate as it should have been. When the surviving horsemen reached the second ridge, they halted, leaped off their horses, and laid down cover fire for the second wave of cavalry. That second line crashed into the Taliban trenches. Suddenly Taliban soldiers were throwing away their weapons and running away. The battle continued to rage as darkness fell. When the aircraft above had to leave to refuel, Dostum’s troops were forced to abandon the battlefield when armored Taliban reinforcements arrived. The attack on Bishqab was followed by a larger engagement at Cobaki the next day. Once again, air strikes knocked out enemy armor and artillery and were followed up by horse cavalry charge. At one crucial moment when it looked like the tide would turn against Dostum’s cavalry, Nelson and a number of other members of ODA 595 found themselves riding into action to help retake the initiative. The strategic initiative had now shifted. But, inaccurate and incomplete news reports trickling out of Afghanistan and widely reported in the media painted a different picture – one in which the offensive toward Mazar-e Sharif had stalled, or worse. This caused Rumsfeld to demand an answer. I am advising a man on how to best employ light infantry and horse cavalry in the attack against Taliban T-55s, mortars, artillery, personnel carriers, and machine guns – a tactic which I think became outdated with the invention of the Gatling gun. [The mujahideen] have done this every day we have been on the ground. They have attacked with 10 rounds of ammunition per man, with snipers having less than 100 rounds – little water and less food. I have observed a PK gunner who walked 10-plus miles to get to the fight, who was proud to show me his artificial leg from the knee down. We have witnessed the horse cavalry bounding overwatch from spur to spur to attack Taliban strongpoints – the last several kilometers under mortar, artillery, and sniper fire. There is little medical care if injured, only a donkey ride to the aid station, which is a dirt hut. I think [the mujahideen] are doing very well with what they have. We could not do what we are doing without the close air support – everywhere I go the civilians and mujahideen soldiers are always telling me they are glad the U.S.A. has come. They all speak of their hopes for a better Afghanistan once the Taliban are gone. Maj. Gen. Geoffrey C. Lambert, the recently installed commander of U.S. Army Special Forces Command at Fort Bragg, N.C., gave high praise to Nelson’s report. Excerpts would be proudly quoted by Rumsfeld in his press conference. On Nov. 2, another team, ODA 534, landed about 25 miles to the west of ODA 595 and linked up with another Northern Alliance warlord in the region, Atta Mohammed Noor. On Nov. 5, Dostum’s cavalry with American airpower help seize the fortified village of Bai Beche. Five days later, Mazar-e Sharif fell to the combined forces of Noor and Dostum. By spring 2002, Special Forces participation was overtaken by the arrival of coalition conventional forces. Essentially, their role was finished. But it was not forgotten. This article first appeared in The Year in Special Operations 2011-2012 Edition. what a great opportunity to show the other side… market for civilian and you should get a PA guy on this now and market what is not secure or jeopardizes SOP !